Jab ap internet se related information ko read karty hain tou apko aksr word Website and Blog parhne ko milta hai.Agr ap online business start karne ka soch rhe hain aur chahty hain k ap online paisey earn kar saky to ap ko en two terms ka knowledge hona zarori hai.Apko maloom hona chahiye k ap k liye Website theak rhe gyi yaa Blog.? 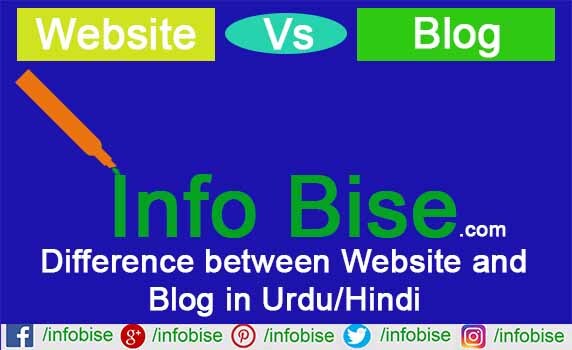 Aj ki es post mein apko internet ki en two terms, Website and Blog k bary mein detail se btawn ga.Mujhe yaqeen hai k es post ko parhne k bad apko Website and Blog mein difference clear ho jaye ga.
Ek Website different web pages ki collection hoti hai.Es ko domain name se pechana jata hai. www.google.com site ka address hai.Aur www.google.com /about es ka webpage hai. Es waqt duniya mein billions k hisaab se Websites majood hain.Ek website k undr bhot se blog ho sakty hain. 1.Website ko mostly kise company k liye bnaya jata hai.Jis ki kuch apne terms and conditions hoti hain. 2.Is ko personally design kia jata aur es ka design company se he related hota hai. 3.Es mein product sell ya company se related information k pages hoty hain. 4.Kuch site mein online chat ka option bhi majood hota hai. Blog information hub hai.Jis pr apne toughts ko share kia jata hai.Jab Blog ko start kia gya tha us waqt blog pr sirf ek he author article ko likh kr share kar sakta tha.Magr ab blog pr Multi-Authors content ko share kar sakhty hain.Blog ek online diary ki tra hai jis pr apne toughts ko dusru k sath share kia jata hai. 1.Blog pr SEO friendly content ko share kia jata hai.Jiss se zaida traffic milti hai. 2.Blog pr paisey kamany k liye ads lage hote hain.For exemple google AdSense. 3.Blog ko subscribe karne k liye feeburner service ko use kia ajat hai.Jaisa k blog ko subscribe karne k liye Feedburner ko isteemal kia jata hai. 4.Blog mein right and left sidebar mein most recent, popular post etc ka widget add kia jata hai. Jitne bhi duniya ki brri companies hain.wo website and blog ko ek sath chalati hain.Blog se unko zaida traffic mil jati hai aur unki site google mein top pe rheti hai.Agr ap businessman hain aur chahty hain k apka business promote ho tou apko Website and Blog donu ko start karna chahiye. Apko Website and Blog mein se kya karna chahiye? Agr ap apni website ya blog create karne ka soch rhe hain tou ap ko yeh daikhna hoga k apko programming language ki kitne coding ati hai. ? Yaa ap es k liye kisse ko paisey dy kr hire kar sakty hain. ? Agr ap apne ilm ko dusru k sath daily basis pe share karna chahty hain aur apko coding ka conept nahin hai tou ap ko Blog create karna chahiye. I hope es post ko parhne k bad ap ko Website and Blog mein difference pta chal gya hoga.Agr apka post se related koi sawal hai tou ap comment box mein poch sakty hain.